Ian Gilby, Lee Coulton, Ste Hirst, Susie Perry, David Vesely and Matt Jenkins. 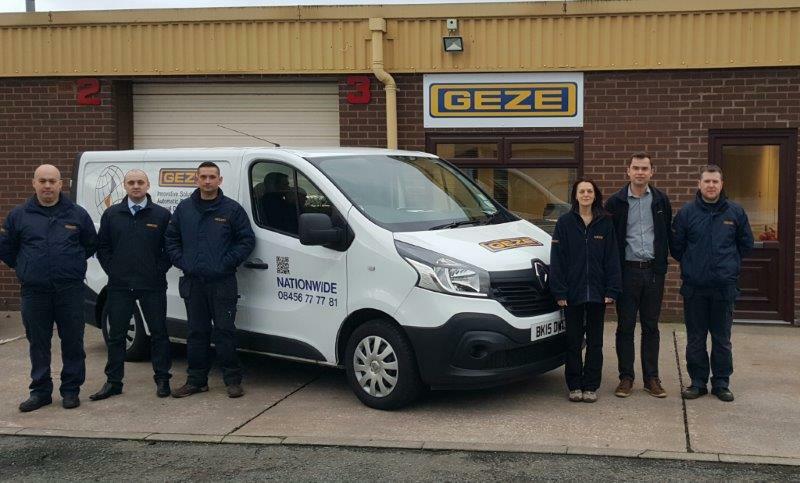 To meet growing customer demand from across the midlands and north, GEZE UK has opened a new 1500 sq ft service office. Based in Warrington, Cheshire, GEZE Service Midlands North will support customers across the M62 corridor, offering quotations, technical advice and faster response times. As well as the large main office there is a meeting room and a training room, which will be fitted out with all the latest automatic door operators for engineer training. The new office complements the service teams based in Glasgow, Newcastle, Bristol, Farnborough (London South), Leighton Buzzard (London North) and the Midlands South team based at the company’s head office near Lichfield. “I am pleased we are making this investment in service for our customers. From this office we will be able to service our full range of products including, automatic operators and natural ventilation systems as well as those manufactured by other companies. The team will support facilities managers in meeting the many and varied European and UK standards and legal requirements. “A local office means that customers are able to benefit not only from our industry experience but from local knowledge, which is particularly helpful when planning engineer visits as they know the local area enabling us to offer faster response times and ensuring we have a local stock holding”. Lee Coulton, who has 15 year’s industry experience, has been appointed as manager. In this newly created role, he will strengthen relationships with existing customers throughout the Midlands and North operating area, develop new business opportunities with public and private sector organisations of all sizes across the region and increase awareness of the GEZE brand along the M62 corridor. Susie Perry who has been with GEZE UK for 8 years has been promoted from service co-ordinator at GEZE’s Midlands Service Office to assistant service manager. Lee and Susie will be supported by two service co-ordinators and eight field engineers. Lee commented: “I’m delighted to be joining GEZE UK and to be given the unique opportunity to set up and run a major new regional operation for one of the key players in the UK entrance solutions sector. For more information about GEZE UK’s comprehensive range of automatic operators, manual door closers and window technology products or service contracts call 01543 443000 or visit www.geze.co.uk.